Tagadamedia offers for free laundry samples if you participate in their program. Read details on their website to make sure you understand the terms of their offer. 4) complete the sample redemption process on the third-party sample provider site. You will not receive a sample unless you complete the Registration Page, complete the offer flow and follow the redemption instructions on the third-party sample provider site. The featured sample is limited in quantity and subject to availability and cancellation by the offer provider. NO PURCHASE OR PAYMENT OF ANY KIND IS REQUIRED TO RECEIVE A SAMPLE. 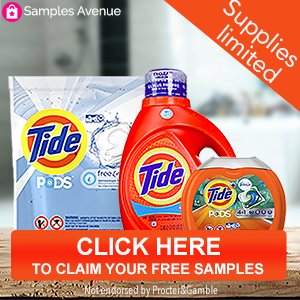 Samples Avenue is an aggregator of samples offers and does not fulfill samples offers. Void where prohibited.